Tractors Owned: 1942 Allis-Chalmers "C" owned 1989-1994. This Cub has been for sale near me for about a year. Serial number indicates 1957. He also has a 57 parts Cub with mower and wants to sell all as a package. Seller is asking too much - but I really like it. Haven't driven it, heard it run or anything. I drive past it twice a day going to and from work. Did I mention that I like it? So none of you guys get any ideas. 1954Frank wrote: Seller is asking too much - but I really like it. Well, if you really like it, go for it. But you may pay too much. Something is not right with the blade. The pressure spring lifting strap is too short - the touch control is in the low position and the blade doesn't even appear to be on the ground. For that matter I think it'll bind if it's raised. Has it been cut off or is that the blade for a LoBoy? Also, the rock shaft extension is missing. It doesn't matter though because you're not pushing anything with those tires. Maybe a bit of snow if it's got chains. Assuming good running condition I think what is in the picture is worth about $1500 (tractor $1,200, wheel weights $300, blade $0). Having written that I think my number might be high. Those rear tires have a negative value unless using it strictly as a mower, and then only on flat dry lawn. 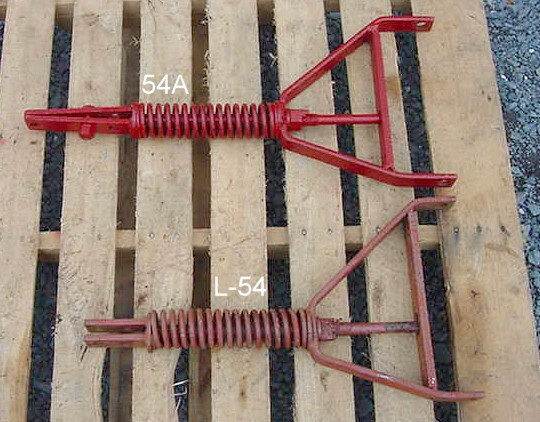 The pressure spring rod assembly is definitely from an L-54. Thanks for the comments... The blade is down on the pavement. Help me learn: what's wrong/ incorrect about the pressure spring rod. A few more pictures posted. Maybe you guys can advise me further, thanks. I also do not like the tires. They are 7.50-24 truck tires, I think. The seller did have two spare rear wheels with tires, ag type. I don't know if they are still available or not. If you’ll notice the picture Don posted from TM with both rods, the one has 3 holes above the spring, the other one has 2 holes. The 2 hole one is for a Lo-Boy. The Cub you posted pictures of has the Lo-Boy rod on an F-Cub. Looks like it would push down far enough, but I would sure make sure I set those stops on the hydraulic quadrant so you didn't raise the plow right up into the oil pan or clutch housing (not sure how far forward the blade sits). There's a lot of "up travel" on that rockshaft! Thanks again. From the right side view it appears the blade sets under the clutch housing. And I see the difference in the spring rods and why the longer one "fits" the cub better. I will have to look at it closer. With the new pictures I can see the blade is mounted wrong to get it down on the ground. It should be mounted at the center holes, not the top. The multiple holes are designed to tip the blade for terracing. If you go up on the right you compensate by going down on the left and vice versa. He's mounted both sides on the top hole to lower the blade. In the proper set up you use the longer lifting strap and there is a 5" extension on the rock shaft. That lets the blade be mounted properly and gives you the full range of travel on the blade. The rock shaft extension is no big deal - it's just a piece of steel strap about 8" long with three holes in it. I just made one for my F Cub last week. The next time I have mine out I'll get you a picture of the set up. It's not a great picture but you should be able to see that the pushing frame is pretty much parallel to the ground (the blade is down). You can also see the rock shaft extension. The rock shaft extension gives enough travel so the blade can be lifted well clear of the ground and also apply pressure to the spring for down force when lowered. Thanks Carl. That picture helps a lot. You will also want to find out if he has the parts to be able to front mount the blade for snow plowing. You can front mount an L54 Loboy Blade on a standard Cub - you actually get more lift on the blade. Thanks Peter for the link. Thanks all. I stopped by where the tractor is parked today after work. The blade is down on the pavement. Without seeing it operate it's hard for me to tell how high it will lift or if it will have any down pressure. I first mentioned this tractor in my New Guy post back in October. In that thread I posted 2 pictures of the parts tractor and mower that's part of the deal. I asked for some help identifying the mower. I know they are poor pictures especially with the tall grass all around. I should go back by there since we've had a killing frost. Just came across this post so forgive me for being late to the party. Putting everything else aside I am hard pressed to understand the purpose of those rear tires. I can't think of a more dangerous set to be installed on a tractor. The only place they'll come close to providing full traction is on dry, rough, macadam. Anything else and they will slip. Even a wet with dew moderately inclined grassy hill and that tractor will slide backwards, forwards, or sideways with no chance of stopping it. I wouldn't even trust driving it up on to the trailer.